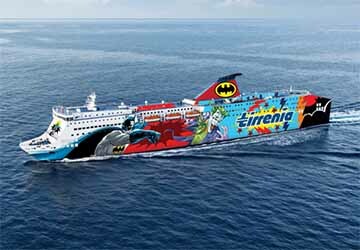 The Sharden is a truly unique ship with either side of the vessel covered in impressive Batman designs. On one side it displays Batman and Robin, with the other showing The Caped Crusader battling with his archenemy, The Joker. Built in 2005 as an evolution of the Bithia class, the Sharden travels at a top speed of 24 knots. It is capable of transporting 2908 passengers and 850 cars on each journey. The ship is stocked full of food and drink options, modern shopping facilities, a cinema, satellite televisions and a children’s area for young voyagers. There are cabins on offer for up to 1212 guests to enjoy this unique sailing experience. 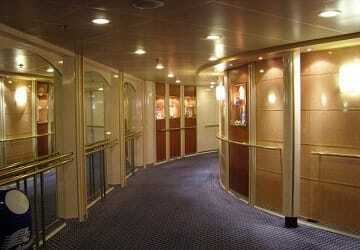 952 armchairs are scattered throughout the vessel with room for a further 744 passengers on the bridge. When Moby Lines renovated their fleet the menu also got a shakeup. The new catering options include typical dishes from Sardinia, Sicily, Campania and Liguria. Travellers can choose from the restaurant, the self service area and the bar to pick up refreshments. Food and drink dispensers provide a quick snack option for those not looking a sit down meal. 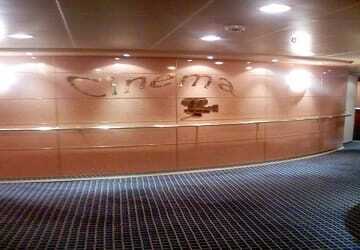 Cinemas on board that show films only a few months after their premiere. As well as screens showing the latest blockbusters there are satellite televisions in public areas. There is a children’s play area on board to keep the young voyagers occupied during their travels. 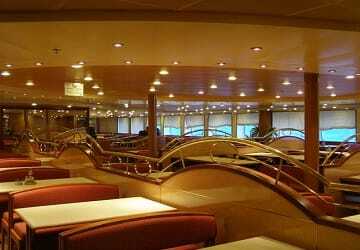 The ship is adapted to cater for those travelling with disabilities and restricted mobility. Please Note: Whilst we have taken great care in making our Sharden guide as accurate as possible, onboard facilities, services and entertainment may vary depending on the date and time of year that you travel, facilities mentioned may change without notification and ferry companies reserve the right to operate vessels other than those mentioned at time of booking without prior notification. Excellent impression from the beginning, nice welcoming started from the staff at the ticket office and at the boarding. Clean enviroments, and clean cabin. I haven't used Tirrenia for years due to the complaint in Sardinia, but this year I booked with them, they had the cheapest price compared to other companies. I'm very satisfied, staff was helpful and the ferry clean. Staff is really professional and helpful. Cabins, coffee and air conditioned are not the best. "all good, much better than the past"
I booked online and during the check in at the port I asked to have a cabin but the guy at the office didn't want to find me the place so he just said that I had to pay €220 to add it. I was shocked. I asked the same at the reception on board and I paid €106.00. How can it be possible? I would give everything 5 stars, but because everything can always be improved, I will give this experience a four and a half. Friendly staff, super delicious food at the restaurant and, unlike last year, both during the outward and return trip, there was a live performance at the bar. Compliments to the gentleman who performed on the return trip, on Tuesday 22nd of July, from Porto Torres to Genoa. I still doubt if it was not the real Eros Ramazzotti, in disguise. So no bad comments, excellent! Regarding my trip, all went well, clean cabin. The only negative thing are the other passengers that as soon as they board they use all the space at the bar to sleep and drink. I understand that they can sleep on the carpet but not at the bar. And the staff never complaint about that, someone should avoid this situations.